According to the Oral Cancer Foundation, one American dies of oral cancer every hour of every day—that’s more than 9,500 deaths each year. And despite a reduction in the numbers of people who smoke or chew tobacco, those statistics have not changed over the last 30 years. In addition, a link between oral cancer and HPV has broadened the population diagnosed with this disease. However, when oral cancer is found early rather than too late, the five-year survival rates jumps from 30% to between 80 and 90%. At 21st Century Dental and Sleep Center in Las Colinas, TX, oral cancer screenings with VELscope® are performed at each one of your regularly scheduled dental cleanings and exams to find signs and symptoms early. Why Choose 21st Century Dental for Oral Cancer Screenings? VELscope is an advanced technology that helps dentists find tissue abnormalities, including cancer and pre-cancer, far sooner than an examination by the naked eye. This handheld device emits a harmless blue light that your dentist in Las Colinas, TX uses to inspect your mouth and tongue. 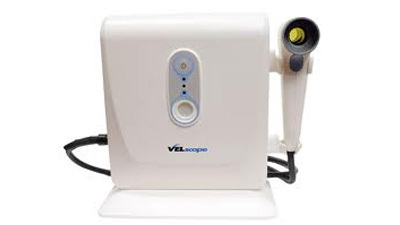 VELscope is sensitive to abnormal tissue changes and the distinctive blue-spectrum light causes soft tissue in your mouth to naturally fluoresce. 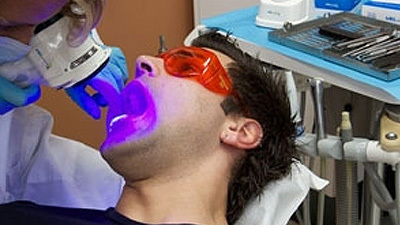 Healthy tissues fluoresce in distinct patterns that may be visibly disrupted when tissue undergoes an abnormal change, such as when an oral cancer is beginning to develop. Velscope is intended to supplement the standard intra and extraoral mouth, head, and neck exam conducted during an oral cancer screening. 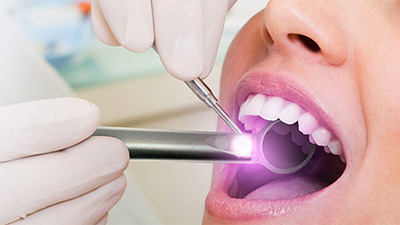 We conduct an oral cancer screening at six-month checkups. During the time in-between these visits to the dentist in Las Colinas, TX, you should be on the lookout for the same early warning signs that we search for during a screening. If you see anything that looks or feels suspicious, then please call our office. Don’t wait for your next checkup to let us know because the sooner oral cancer is found, the better!